- Alexander Ljung + Eric Walhforss, "Trust in networks"
- Sampo Karjalainen / Sulake, "Fostering open-ended play"
- Aleksi Neuvonen + Roope Mokka, "Society 2.0"
- Armin Medosch, "The Emergence of Open Source Culture"
- Lisa Haskel, "Open source culture in education"
- Cristina Ricupero, "Self-organisation / artist projects"
- Marko Ahtisaari / BLYK, "What Advertising Could Become"
Trust has long been essential to all collaboration, commerce and the forming of community and society in the offline world. Trustmojo (trustmojo.com) is a research project exploring the nature of interpersonal trust in the increasingly prominent world of novel web-mediated social spaces. The starting point of the project is a study on four california-based Web 2.0 services in which trust takes on vital roles. The study serves as a basis for an analysis that borrows theories from offline sociology in order to better understand how trust forms and transforms online. In this presentation some exciting findings will be exposed and discussed. Trustmojo is the joint master’s thesis and forthcoming book by Alexander Ljung (alexanderljung.com) and Eric Wahlforss (eric.wahlforss.com) at The Royal Institute of Technology in Stockholm (www.kth.se). Aside from writing about trust they’ve also recently started a company in the online music space. Sampo Karjalainen (29) is co-founder and Chief Creative Officer of Sulake Corporation, the creator of Habbo. Habbo is an award-winning browser-based virtual world and gaming environment for teenagers. There are 29 local Habbo communities around the world and over 7,2 million unique visitors per month (Source: Nielsen/NetRatings SiteCensus, Jan 2007). Habbo is a successor to Mobiles Disco, a non-commercial hobby project launched by Sampo and Aapo Kyrölä in fall 1999. Before Sulake, Sampo has worked in pioneering new media companies of Finland: To the Point (1994-1998) and Satama Interactive (1998-1999) as a graphic designer and an animator. Oranssi was initiated in 1990 as a squatting movement, taking over abandoned buildings for cultural activities and for people to live in. Today Oranssi is continuing similar activities on various levels – both as an established organisation with responsibility of taking care of several buildings, as well as a grass-root organisation promoting citizen level activism. Terike Haapoja (chairman of Oranssi) will talk about community building and collective responsibility from Oranssi’s perspective. 'The Next Layer or: The Emergence of Open Source Culture'. Armin Medosch will give a presentation about his research on free software hackers and open source activists (to be published as a book in future). Armin is a writer/artist who has engaged with and researched open wireless initiatives in London and Vienna. Ravensbourne College close to London offers a unique and intensive masters programme in Online Media. Lisa Haskel runs the course online resources and teaches networking and programming skills. She will show how using Free Software tools and understanding Open Source culture is enabling students to work independently and collaboratively on groundbreaking networked media projects. Since 1994 Lisa Haskel has been a producer of conferences, workshops and residences that seek to discuss the social impact of technologies and support networks of people active in creating new media platforms and tools with social purpose. Her projects include the tech_nicks and tech_2 touring programmes. She is also involved in collectives providing internet hosting to non-profit groups. In March 2006 NODE.London provided the context for a month-long Season of Media Arts, which made visible 150 events in 40+ locations according to principles of distributed curation, openness and concensus-based decision making,. Tim Jones, the Project Coordinator, offers some observations about NODE.London’s first skirmishes with the the conventional systems, and expectations, for cultural production in London; and the tactics inherent in sustaining a ‘bottom up’ approach to developing the infrastructure for ‘media arts’. Tim Jones is is an independent arts producer. He is active across art forms and contexts, and his most recent work focusses on developing and sustaining effective networks for cultural production – particularly in ‘media art’ and electronic music. 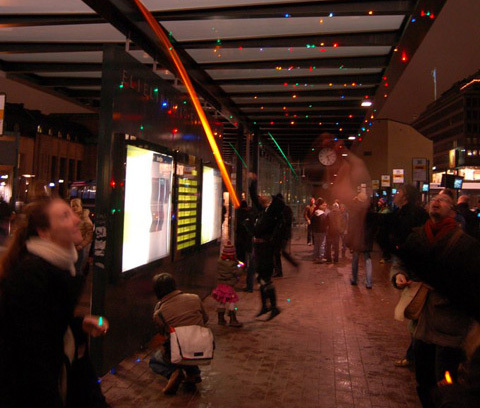 The 'Tähtikuvitelma' workshop produced a public art/light installation which existed during 6 months of winter 2005-2006, and was a very material architecture for participation. Balancing openness with constricting rules, the workshop provided a example of successful framework for participation, maintaining a coherent aesthetic to the resulting production. The Helsinki cultural greenhouse ‘Happihuone’ was boarded up and covered with 40 ‘star constellation’ designs by 45 invited and adhoc persons. The presentation aims to raise for discussion connections between participatory art processes and micro-contributions in physical/online spaces. Andrew Paterson: My creative practice involves working in the roles of initiator, participant, author and producer, according to different collaborative and interdisciplinary projects. These roles operate within the field of media/socially-engaged arts and activism, where engagement is a conversation, devised situation, workshop or event. "I am part of the team behind Blyk. Blyk is a pan-European free mobile operator for young people, funded by advertising. We're launching first in the UK market in mid-2007, with other countries to follow. Before Blyk, I worked as Director of Design Strategy at Nokia, a world leader in mobile communications. I joined Nokia in 2002 and held management positions in venturing and corporate strategy, always with a focus on creating new growth through better user experience. I was born in Helsinki, Finland and raised on three continents in Helsinki, Dar es Salaam and New York. I went on to study philosophy, economics and music at Columbia University in the City of New York where I lectured for several years. During my years at Columbia I had a parallel professional life in music as a bassist and composer." Jyri Engeström is founder of Jaiku, a service that brings people closer together by enabling them to share their rich presence. Jaiku members share presence messages on the Web and mobile phone by text messaging and using a mobile application. Before founding Jaiku, Engeström worked for Nokia and helped to shape the company's Wi-Fi device offering. He also actively engages in conversation about technology and society, and is often recognized for introducing social objects as an alternative way to conceptualize social networks. Engeström hosts Aula, an event that attracts an international audience to his native country of Finland. Jarmo Eskelinen has a mixed and rich background. He is best known as the producer of large-scale media productions, cultural events and research projects. Originally trained as an architect, he is an expert in the areas of digital media, experience industry and content development. Since the beginning of 2006 Elukka has been the executive director of Forum Virium Helsinki, development cluster in which companies and R&D organisations co-create market driven digital services and content. The cluster is formed by 16 major companies, such as Finnish Broadcasting Company, Nokia, TeliaSonera, Hewlett-Packard, IBM and Siemens. The public sector is represented by the City of Helsinki and the key actors of the Finnish innovation system, such as TEKES, SITRA and VTT. Forum Virium Helsinki coordinates practice-based R&D projects, utilising open innovation and service design methods. The target areas of the cluster are healthcare, traffic, education, retail trade, digital home environment and multi-channel media distribution. Journalist and media researcher Teppo Turkki has written "Minuus mediassa", a book dealing with the effects that new media, internet and digital culture have on individuals and the society. He was recently a Visiting Scholar at Waseda University in Tokyo and wrote a book "Kahdeksan pilven takaa - Japanin murros ja uusi nousu", describing the ongoing transformations in politics and society in Japan. Teppo is currently working as the director of IADE, a recently established educational institute (a collaboration between University of Art and Design and Theatre Academy). Ilkka Tuomi has written books, including "Networks of Innovation: Change and Meaning in the Age of the Internet", and "Corporate Knowledge: Theory and Practice of Intelligent Organizations". Tuomi has written several articles in First Monday, an important peer reviewed journal on the Internet. The most famous of Tuomi's articles is probably "The Lives and Death of Moore's Law", in which Tuomi states that Moore's law is an expression of technological determinism, used sloppily, and to a large extent not properly founded in empirical studies. Recent papers and presentations include "Learning in the Age of Networked Intelligence" and "Open Educational Resources: What are they and why do they matter". Gunnar Green studied digital media at the University of Arts Berlin. His work is a blend of graphic design, technology and mischief and is placed in unusual environs. “Exceptionally innovative and entertaining,” commented De:Bug about the project Parasite, a portable projector system that makes subway tunnels into a canvas for a journey into a surreal world, developed in cooperation with Richard The and Frédéric Eyl. His work has been presented at the Museum of Sketches in Lund, Transmediale [Here/There] Berlin and Profile Intermedia 09. He has received an Honorary Mention from Ars Electronica and a Gold Award from :output, a foundation for future, design and education. Jean-Baptiste Bayle is an artist and hactivist, creator of myownspace.fr and the Billie Jean p2p Collection (both featured in Pixelache 2007). Flash ActionScript developer for object-oriented and data intensive projects. Also specialized in debugging and fixing existing applications. Other experience includes brand and user experience strategy consulting, importing, music production, art direction and web development tasks from client-side to back-end. Currently co-authoring a book on social media and marketing (in Finnish). Interested in user experiences, goal-centered design, explaining stuff and helping businesses take advantage of All Things 2.0.